The other day I was having a casual conversation with a group of women I’ve known for quite some time regarding a special project I’ve been working on through the foundation I founded. I was talking about how I haven’t slept in months as I’m juggling a full-time job, the general day-to-day operations of a nonprofit organization (all volunteer), a child with special needs and my role as a wife. Trying to keep the focus on the positive change I’m trying to create (and not the bags under my eyes), I started going into detail about the inclusive playground I’m fundraising for in my community. I’m not sure why you felt compelled to enter this conversation when I don’t even know you, especially given that you did so with bad intentions. I have to be honest — when you first began questioning me about this playground, I truly thought you were interested in my project. You started asking about your apparent role in it. Since I was a bit taken aback, I’m not sure if I adequately answered your questions. Just in case, I’ll take a minute to thoroughly answer them now. 1. Why would I want to financially contribute to an inclusive playground? Let’s pretend for a minute that this question was formulated out of genuine curiosity and not sarcastic evilness. If you don’t know, an inclusive playground is a playground where children of all abilities can play together. It’s specifically designed to provide ample opportunity for physical, social and sensory development of children with disabilities, as well as children who develop typically. Believe it or not, new playgrounds are only required to provide access to 50 percent of elevated play components and one type of each ground-level activity (swings, spring riders, panels, etc.) offered for children without disabilities. So if a child without disabilities has access to six different swings, a child with a disability is only required to be offered access to one, and, even if a child with a disability is offered access to a swing or spring rider, it doesn’t necessarily mean they can use it. If a child is unable to sit up on their own, how can they possibly support themselves on a typical belt swing? I guess it is the thought that counts, right? Back to the question. By contributing to an inclusive playground, you’re going to give all children in your community the opportunity to play on a playground, including yours. Short and sweet. 2. What does a disabled child playing on a playground have to do with me? Ugh! First of all, I prefer person-first language when we talk about “these people.” By saying a “disabled child” and not “child with a disability,” you’re implying that the disability defines the child… and it doesn’t. Not a big deal, but learn from your mistakes. OK, when you asked this question, my heart shattered into pieces. It’s an unfortunate reminder of the barriers that still exist for my child and all other children out there with disabilities. It’s this type of attitude that continues to allow these barriers to exist. It’s not my child, so it’s not my problem, right? Before my son, Giovanni, was born, I never gave a thought to what opportunities did and didn’t exist for children with disabilities. It wasn’t because I didn’t care. I just never had a reason to think about it. I guess I always assumed they had everything typically developing children had. Why wouldn’t they? Although we didn’t get an official diagnosis for my son until two weeks before his first birthday (the year from hell), he had problems right from the minute he entered this world. While the inequalities didn’t rear their ugly heads until he got a little older, it was only a matter of time until reality hit. It was a peaceful summer afternoon, the sun was shining, the birds were chirping, the… you get the picture. For the first time, instead of using the little plastic swing set Giovanni received for his birthday, we stopped at the playground just down the road from our house. The playground was bustling with rambunctious children, and we were excited to have Giovanni play there for the first time. 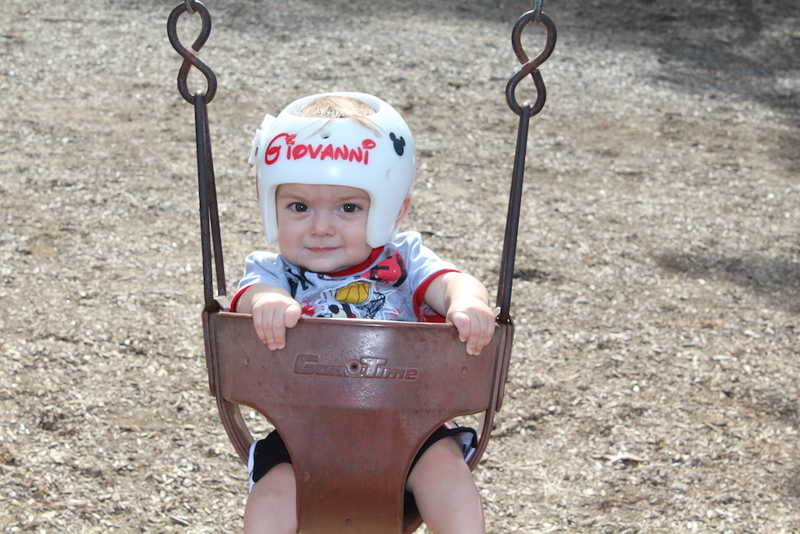 I naively walked into the gated play area and set Giovanni free. After about 15 minutes, I noticed he wasn’t really interacting with the other children. He was just walking around the perimeter of the main play structures. Not thinking much of it, I scooped him up and brought him to the play area specifically designed for smaller children. The top ramp, right above the slide, was being guarded by three little girls, who vocally expressed that they didn’t want him there because they don’t like boys (got to love girls). Despite the lack of invitation, Giovanni was determined to get up to the platform and play with them. But wait, why wasn’t he going up? Unfortunately, not only was the lowest platform too high for him to lift his leg up onto, one of his AFOs (a rigid brace that runs from his knee to the end of his foot) got caught on the edge of the lowest platform. My world came crashing down. I was starting to realize all the events I somehow missed since the moment we walked through the gate. He was walking around the perimeter of the play structures because he wasn’t able to step over or climb over the barrier that held the wood chips in place; he didn’t want to walk around the wood chips, even after we lifted him over the barrier, as his shoes were filling with wood splinters when he shuffled on his toes; he was a bystander because he had to be. My son did not have the opportunity to play on this playground — the playground in his neighborhood. So to answer your question, I never thought it had anything to do with me either. 3. (And this is more of a statement) Well, my child can play on any playground he chooses. Well good for you. It was at this point that I realized I wasn’t going to get through to you. I realized that, for some unknown reason, your defenses were up. There was no point in continuing my efforts to share some of the personal details behind this amazing project. The important thing to remember is that I too used to think (or not think) this was my responsibility. I know it’s hard to understand something you’ve never experienced; I get that. But what I ask, what I’m begging you to do, is to try putting yourself in my shoes, my son’s shoes, for just one minute. Think how it feels to see your child struggle with something as simple as playing, how it saddens you to realize that society still thinks your child deserves less than what a typically developing child does. Think about how it feels to be that child, unable to play with your friends because of something you have no control over, the feeling of isolation and sadness that fills your heart because you’re different from the other kids. Just remember that I used to be you. I used to be the person, the woman, the mom, who didn’t think about that child across the room in the wheelchair, the person who just smiled and walked away as that child sat by themselves while the other children played. To learn more about this inclusive playground project, please visit www.cmcdfoundation.org/inclusiveplayground. Krystyn currently works as a Clinical Liaison in the pharmaceutical industry where she works with physicians and treatment centers to increase awareness, screening and treatment of opioid dependence, while focusing on quality patient care. She has more than 16 years of experience in the health care industry which includes work in mental health, addiction medicine, geriatrics and emergency medicine. She received her bachelor of arts in Psychology from Siena College, a master of arts in Community Psychology from Sage Colleges and a doctorate of philosophy in Behavioral Medicine/Health Psychology from Walden University.